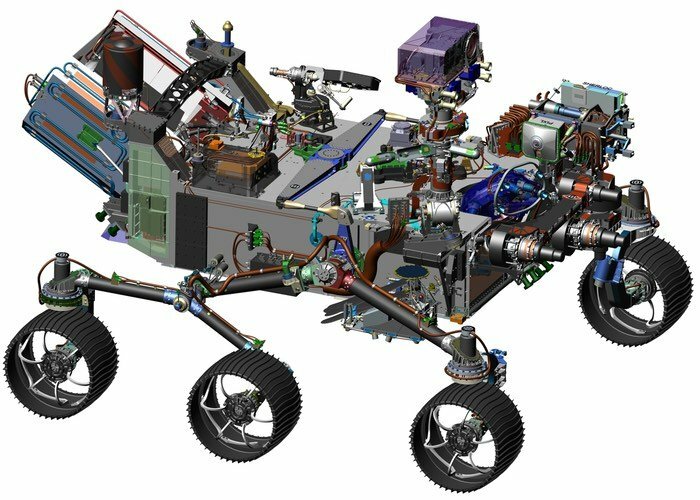 NASA has revealed the first details about its new Mars Rover which is currently being developed and tested to hopefully launch sometime during the summer of 2020, in preparation to land on the Red Planet in February 2021. As you can see by the image above the new Mars Rover looks very similar to the previous six wheeled rover Curiosity, which is currently exploring Mars. But will be equipped with new instruments and enhancements to explore Mars like never before. The Mars 2020 rover is the first step in a potential multi-mission campaign to return carefully selected and sealed samples of Martian rocks and soil to Earth. This mission marks a significant milestone in NASA’s Journey to Mars — to determine whether life has ever existed on Mars, and to advance our goal of sending humans to the Red Planet. Once a mission receives preliminary approval, it must go through four rigorous technical and programmatic reviews – known as Key Decision Points (KDP) – to proceed through the phases of development prior to launch. Phase A involves concept and requirements definition, Phase B is preliminary design and technology development, Phase C is final design and fabrication, and Phase D is system assembly, testing and launch. Mars 2020 has just passed its KDP-C milestone. For more information on the new Mars 2020 rover jump over to the official NASA website via the link below.